Over the past eight years, much of the U.S. federal government’s operations have become something of an unmitigated bureaucratic mess. Whether we’re talking about the Defense Department, the EPA, the DEA, the IRS, the VA, the Energy Department, Medicare, Medicaid, the Department of Health and Human Services or the Department of the Interior, to name just a few, we have all seen far too many recent examples of mismanagement-enabled wasteful spending. Budget for major national goals by reviewing the relevant portfolio of spending, tax expenditures, regulations and other policies. Strengthen the congressional budget committees, making them leadership committees that take a bigger role in shaping budget priorities and directing the work of other panels. Establish a multi-year budget framework and process with annual targets for budget savings and investment consistent with fiscal sustainability. Budget for tax expenditures and mandatory programs by regularly reviewing them and including tax expenditures in revenue and spending totals. Revisit the use of budget concepts using a bipartisan process established by the president and Congress. These are decent ideas, which were developed by the National Budgeting Roundtable. However, considering just how badly managed so many U.S. government departments have become with respect to their fiscal stewardship of U.S. taxpayer funds, it may be more beneficial to fold these suggestions into a much more comprehensive approach that would go considerably deeper to achieve positive results: Zero Based Budgeting. ZBB is a budgeting process that allocates funding based on program efficiency and necessity rather than budget history. As opposed to traditional budgeting, no item is automatically included in the next budget. 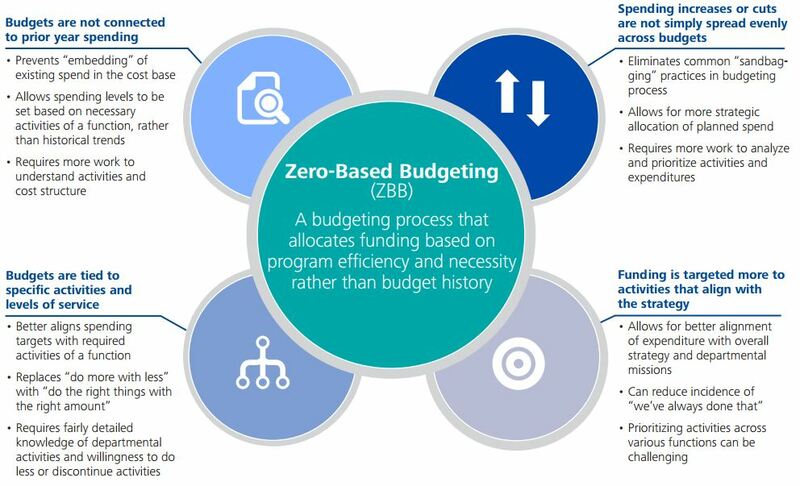 In ZBB, budgeters review every program and expenditure at the beginning of each budget cycle and must justify each line item in order to receive funding. Budgeters can apply ZBB to any type of cost: capital expenditures; operating expenses; sales, general, and administrative costs; marketing costs; variable distribution; or cost of goods sold. When successful, ZBB produces radical savings and liberates organizations from entrenched departments and methodologies. 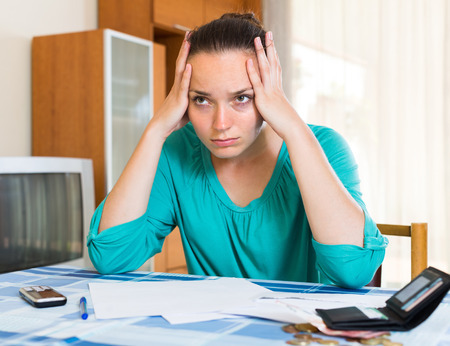 When unsuccessful, the costs to an organization can be considerable. Deloitte also provides the following infographic describing the key concepts behind it (click for a larger version). 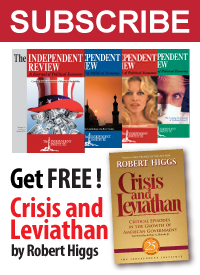 Perhaps the most surprising thing about ZBB is that it was originally employed to right the federal government’s fiscal house back in the 1970s, long before it was rediscovered by private sector firms bleeding cash in the years following the 2008 Financial Crisis and used to turn their financial fortunes around. Deloitte recognizes the potential for the federal government’s current situation in needing to get its spending under some semblance of control. For organizations looking to grow by releasing capital through improved cost management, ZBB offers appealing possibilities for reducing costs while bringing additional value in the form of operational efficiency. In a best case scenario, ZBB may reduce SG&A costs by 10 – 25% within six months. The potential impact can be especially pronounced in the public sector, where ZBB could theoretically encourage Congress to only pay for necessary and efficient programs as opposed to sanctioning automatic increases in government spending. This could be especially insightful when applied to programs and agencies that claim the biggest portions of government funding. For instance, while defense spending for 2016 was originally set at $523 billion, Congressional support for additional spending increases will bring total defense funding for that year to $619 billion. This $96 billion increase will occur on top of the previous budget, without adjustment for any previous fluctuation in needs or priorities. If government agencies were to actively seek an accurate base budget before spending increases were applied, additional funding could be allocated more effectively and efficiently. Additionally, by forcing agencies and lawmakers to actively prioritize each program, ZBB could increase organizational efficiency by encouraging stakeholders to work together to analyze operations. In turn, this forces cost centers to identify their mission and priorities, which helps align resource allocations with strategic goals. Furthermore, by creating a budget and baseline from zero, government agencies would benefit from perceived increases in transparency and accountability both internally within their organization and externally with the public. That’s the kind of outcome that both elected and appointed officials across the entire political spectrum in Washington, D.C., need to deliver. Zero Based Budgeting has delivered those kinds of results in the past – its time has come again for the U.S. federal government’s desperately needed comprehensive fiscal reform.